I’ll admit it. I have a thing for tacos. All those years living in Mexico City made me a fan and a day doesn’t go by that I don’t crave them. I’m fortunate enough to live in a city that has its share of great spots to have a few of my favourites. Fish tacos, yes. Cauliflower tacos, double yes. Tuna tostadas, take all my money! At home we make them regularly. Come warmer weather it’s either fish or shrimp, and just the other day I made a curried cauliflower version that both of the girls loved, and that I promise I’ll be blogging soon. So why am I such a fan of these little darlings? Many reasons, but let’s just say that they are true food for the soul. 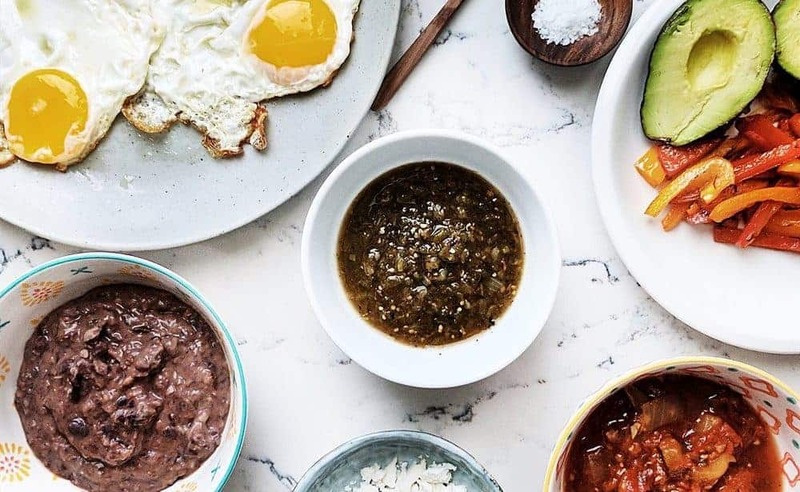 When you get to see how corn tortillas are made, the whole process of making an authentic salsa and see how people line up on a Saturday while shopping at an outdoor market to have them for breakfast, you are bound to not only fall in love with tacos, but to have more insight into a dish that says Mexico like no other. Mornings is Mexico typically started with a long run that would take me to the heart of the city, el Zócalo. I would run home knowing that on my way back, a fresh juice and those out of this world huevos rancheros would be the sweetest reward after an 18k. A couple of days ago, I gave them my own take and had them for brunch at home. 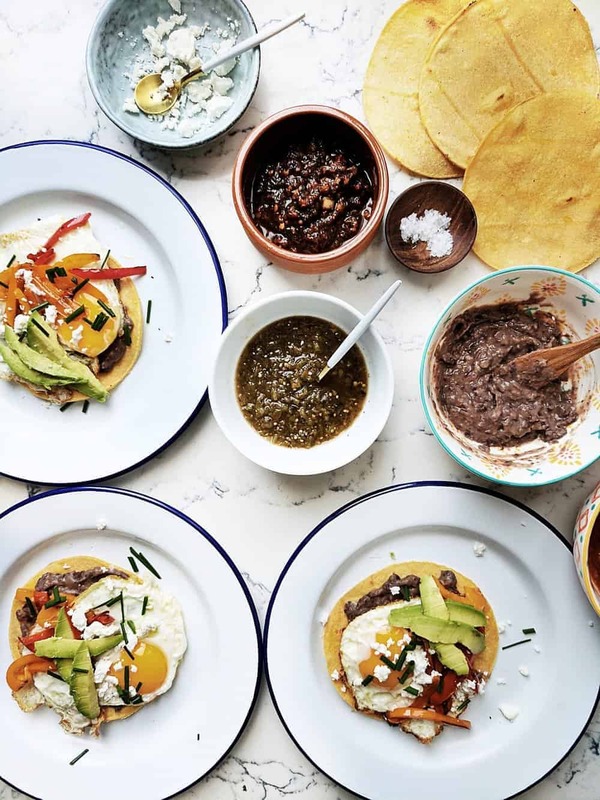 You can make them with flour tortillas, though corn tortillas are my go to. Have a few friends over, make a white sangria and have the best brunch date ever! Cut peppers in thin strips and sauté in 2 tbsp of olive oil over medium heat for about 3 minutes, or until peppers start browning a bit on the edges. Set aside. 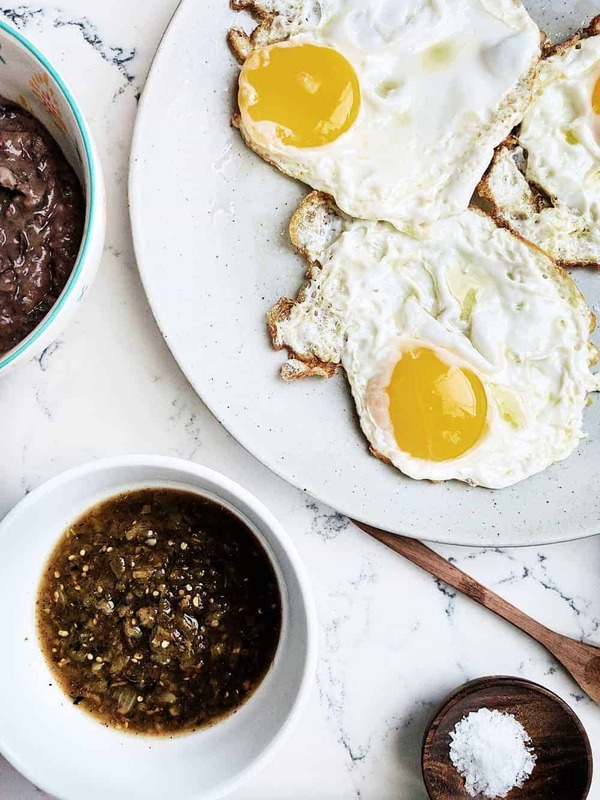 Rinse the black beans and pulse in a blender along with one tsp of chipotle in adobo and pinch of salt, until a paste forms but black bean bits can still be seen. 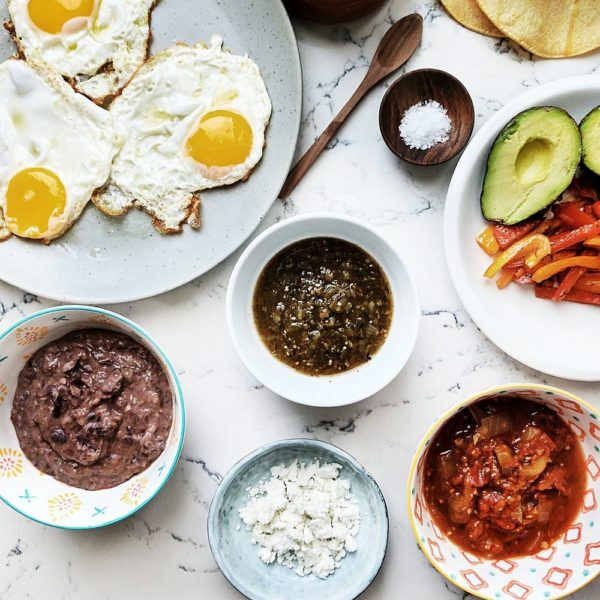 Slice the avocados, place the goat cheese and salsas in bowls, and fry the eggs in 1/4 cup of olive oil, until edges start to brown and yolk remains soft. 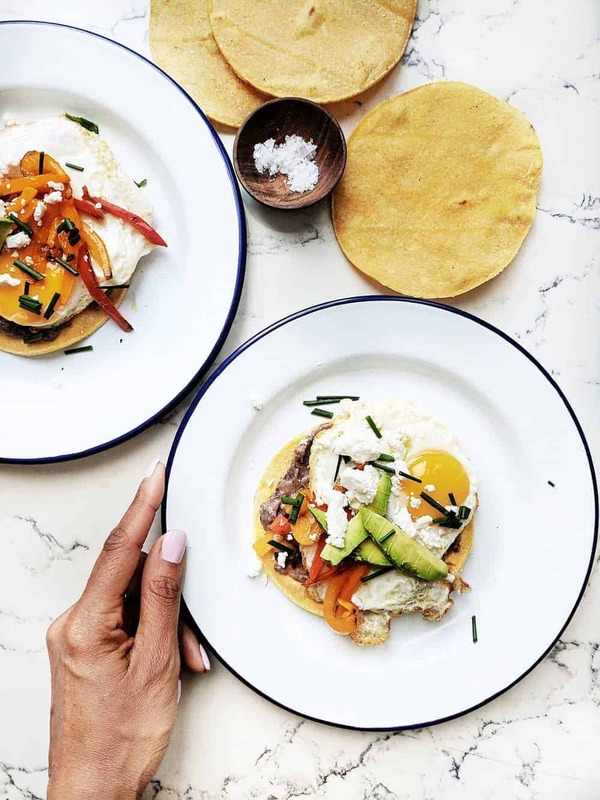 Place fried eggs in a plate and warm the tortillas in a frying pan set at medium- high, 1 minute per side. 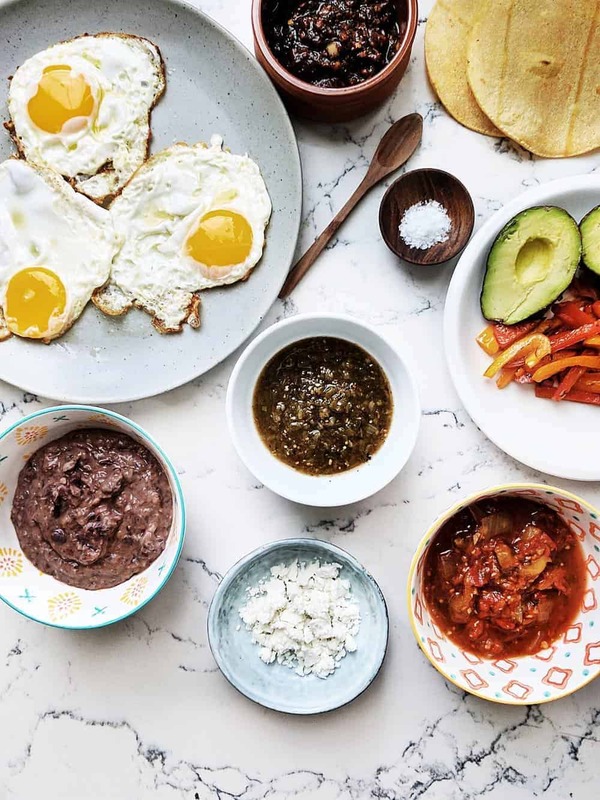 Once ready, you and your guests can top each tortilla with 2 tbsp of the bean and chipotle mix, peppers, a fried egg per tortilla, goat cheese, avocado and chives and top with your favourite salsa. 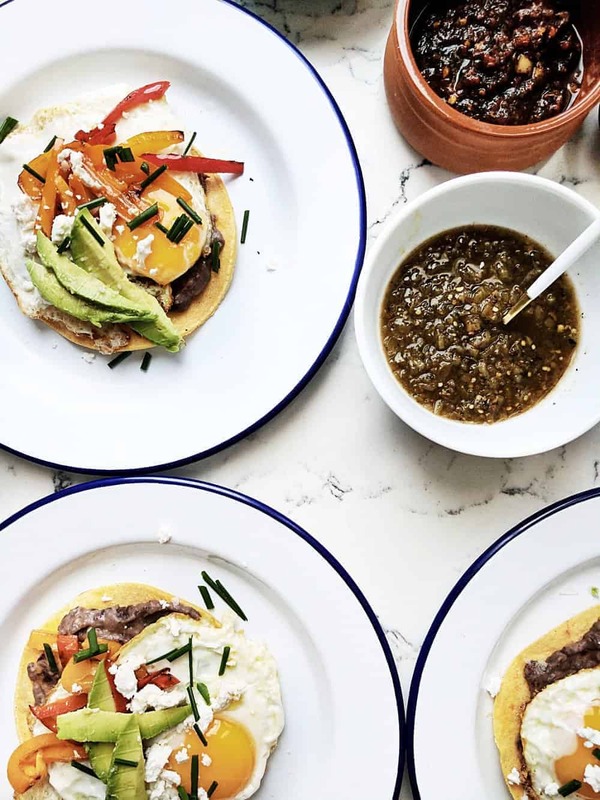 I love the idea of tacos for brunch, these sound delicious!